The Jeep Wrangler has always been on the cutting edge of rugged design. That's why this compact SUV is a perennial favorite of drivers in Rockville. 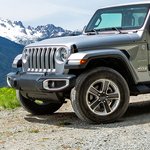 The latest generation of the Jeep Wrangler has a bevy of exterior improvements that make it even more attractive. When you buy the Jeep Wrangler, you'll still get this famous model's iconic styling that includes round headlamps, a seven-slot grille, flat fender flares, fold-down windshield and removable top and doors that put the wind in your hair and give you a sense of freedom whenever you go on an off-road adventure. Opening your Jeep Wrangler to the elements on a warm day is easier too. You'll enjoy the new Sky One-Touch Power Top that allows you to open the top at the push of a button. When you want to remove the doors, the new multi-length hinge pin system simplifies removal along with reinstallation.